This easy-to-make Pressure Cooker / Instant Pot Beef Stew is the perfect cold weather comfort food. You can have this hearty stew on the table in just over 30 minutes when you make it in your electric pressure cooker, but it’ll taste like it simmered all day. We’ve settled into cold, gray, January weather here. The kind of weather that basically begs for something warm and hearty and old-fashioned. 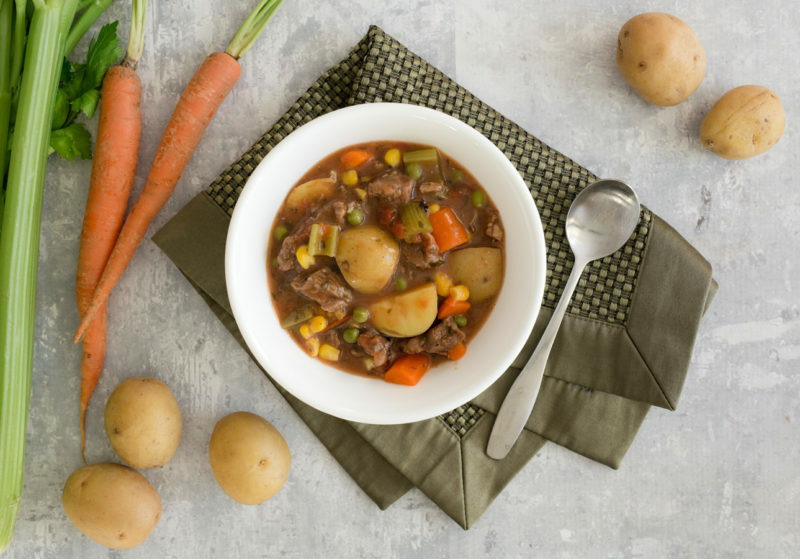 This Instant Pot Beef Stew is a classic, old-fashioned recipe, based on a stovetop version my mom cooked for me growing up. I took the original recipe and simplified it a little. I prefer to use small new potatoes so I can skip the peeling and dicing. (However, if you prefer to use russet potatoes, substitute 2 cups diced russet potatoes.) I like having bigger chunks of carrots and celery in my recipe. However, if you want to skip chopping all together, you can use a frozen mixed vegetable medley and just use a 12 minute cook time and a 10 minute natural pressure release. This Pressure Cooker / Instant Pot Beef Stew will help remind you of the good side of winter—the cuddled in a blanket in front of a fire reading a book kind of winter. What Meat Is Best for Beef Stew? I prefer to use chuck roast for beef stew, though I’ll also use a rump roast if it’s on sale. 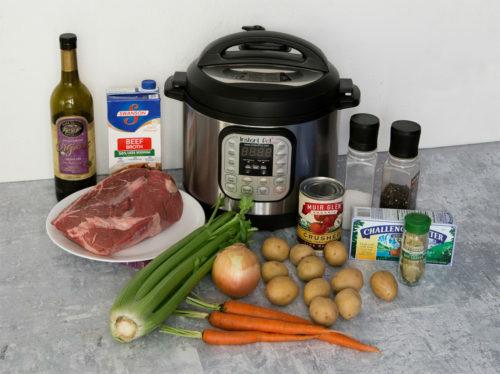 Chuck roast has a little higher fat content than rump roast, which gives you a more flavorful stew. Both cuts are fairly inexpensive, trim up easily, and result in tender beef . 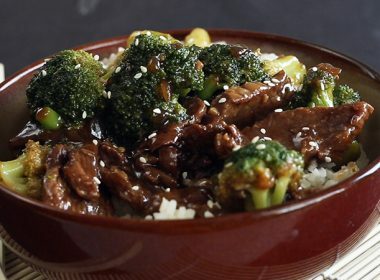 The #1 thing you can do for a flavorful stew is to brown the beef! Especially when you’re in a hurry, it can be tempting to just throw everything in the pot to cook. However, you miss out on so much flavor this way! See all the browned bits in the picture below? We had just added the onions to the cooking pot after browning the beef. 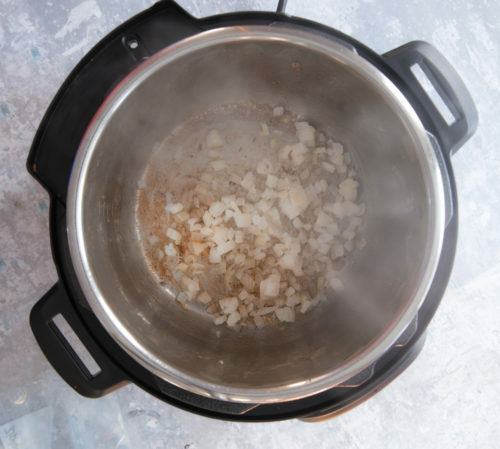 Once the onions are cooked, add the beef broth and then give the bottom of the pot a good stir to loosen all of the browned bits from the bottom of the pot. The more browned bits, the more flavorful the stew will be. Should I Use Red Wine in Pressure Cooker / Instant Pot Beef Stew? I went back and forth on whether to include red wine in this Instant Pot Beef Stew. Traditionally, the acidic red wine would flavor and help tenderize the stew meat during the hours it simmered on the stove. If you do wish to add red wine to the beef stew, the Cook’s Illustrated article recommended a $10 bottle of Côtes du Rhône or another red wine made from a blend of grapes and that has medium body and very little oak flavor. (Do not use a traditional cooking wine in this recipe.) I would probably substitute ½ to 1 cup of red wine for the same amount of beef broth. 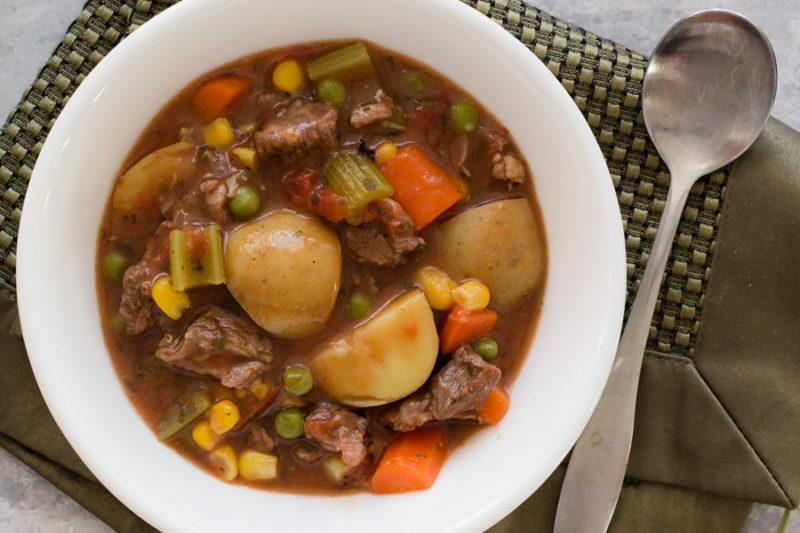 You can choose a flour or cornstarch slurry to thicken your stew. Since I grew up eating stew thickened with flour, that’s what I wanted to use in this recipe. In traditional stews, it’s common for the uncooked stew meat to be dredged in flour and browned before adding the liquid. 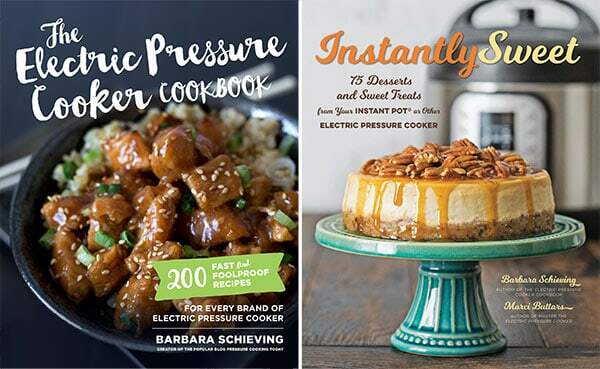 However, that technique is a NO-NO for electric pressure cookers. 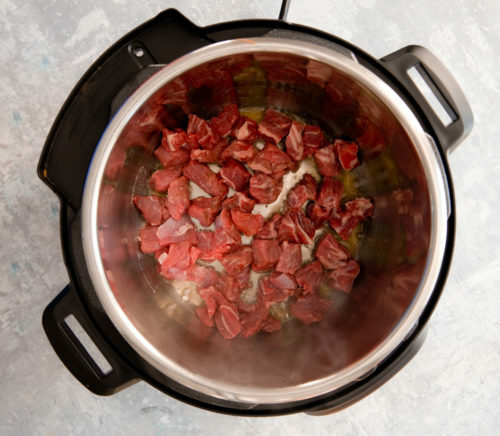 Flouring the beef before cooking can lead to a thick, flour-y build up on the bottom of your pressure cooking pot—resulting in a Burn notice and a ruined stew. For best results, you’ll need to add the flour after pressure cooking. To do this, make a slurry. Stir together ¼ cup flour with ¼ cup cold water. The cold water here is key—if you use warm water, the flour will clump. You want to stir the flour–cold water mixture until smooth. Then I like to add about a cup of the warm broth from the stew to the flour slurry and continue stirring until smooth. Then I’ll pour this flour mixture into the pressure cooking pot, stirring constantly. 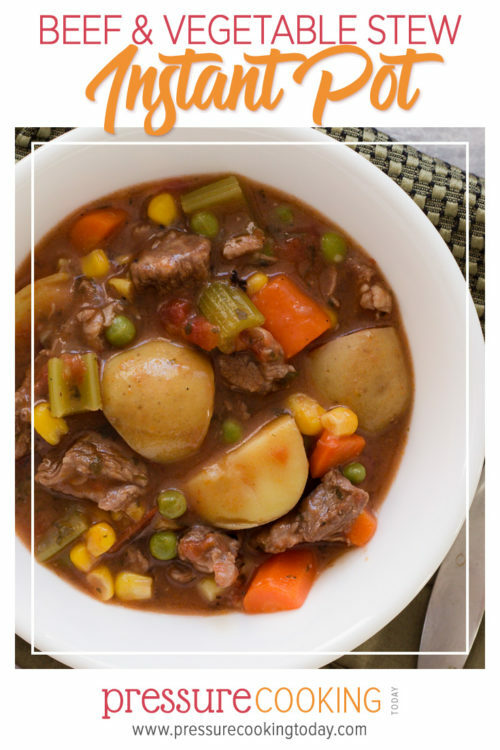 If you’re looking for a gluten-free beef stew recipe, you can absolutely substitute cornstarch for the flour in this recipe. I’d start with 2 tablespoons of cornstarch mixed with 2 tablespoons of cold water and then add to the pressure cooking pot. (Never add cornstarch to the pot without mixing it with water first.) Select Saute and simmer until the stew thickens. I’d love to know—what are your favorite winter-time comfort foods? Season the beef generously with salt and pepper. Select Sauté and add the vegetable oil and butter to the pressure cooking pot. When the butter is melted, brown the meat in batches for about 5 minutes per batch until all the meat is browned—do not crowd the pot. Add more oil as needed. Transfer the browned meat to a plate. Add the onion to the cooking pot. Sauté for about 3 minutes, stirring frequently, until softened. Stir in the beef broth to deglaze the pot, scraping up any brown bits from the bottom of the pot. Stir in the crushed tomatoes, parsley, bay leaves, and browned beef with any accumulated juices. Lock the lid in place. Select High Pressure and 10 minutes cook time. When the cook time ends, let the pressure release naturally for 5 minutes and finish with a quick pressure release. When the valve drops, carefully remove the lid. Add the potatoes, carrots, and celery. Replace the lid and cook on High Pressure for 2 minutes more. When the cook time ends, turn off the pressure cooker. Let the pressure release naturally for 5 minutes and finish with a quick pressure release. When the valve drops, carefully remove the lid. Remove and discard the bay leaves. In a small bowl, whisk the flour and cold water until smooth. Add 1 cup hot broth to the flour mixture and stir to combine. Add the slurry to the pot. Select Sauté and bring the sauce to a boil, stirring constantly until it thickens. Stir in the corn and peas. Season with additional salt and pepper to taste. If you prefer russet potatoes, substitute 2 cups peeled and diced into bite-sized pieces. *If you want to skip chopping vegetables all together, you can use a frozen mixed vegetable medley with carrots, peas, and corn. I'd add about 2 cups. Use a 12 minute cook time and a 10 minute natural pressure release, then finish with a quick pressure release. Looking for more pressure cooker comfort foods to fend of the winter blues? If you like mushrooms, you have to try my Beef and Wild Mushroom Stew. 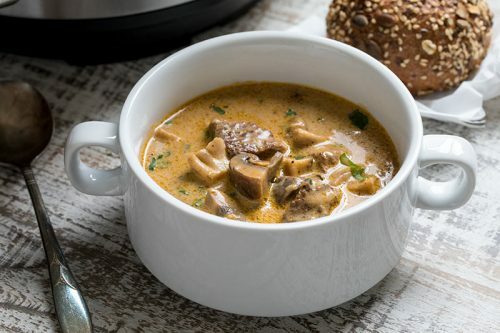 This is my pressure cooker version of Deer Valley’s popular stew, and it features a rich sauce made with white wine, heavy cream, and mushroom stock. 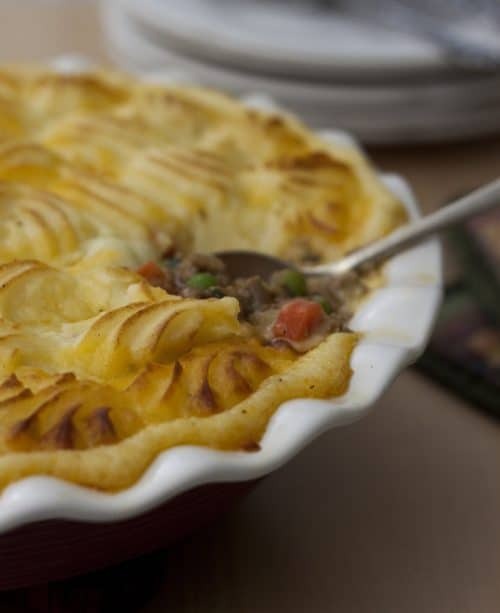 Shepherd’s Pie is another meat-and-potatoes food I love in the winter time. I often use ground beef since it’s inexpensive and I generally have it on hand. 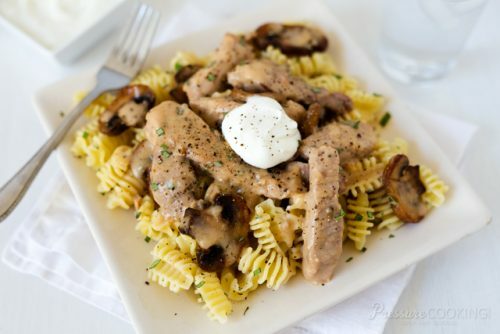 My Beef Stroganoff uses inexpensive round steak to create a flavorful gravy that I’ll serve over egg noodles or mashed potatoes. Thinking to purchase the Instant Pot Nova Plus, 6 quart, and looking at your Beef and Vegetable Stew receipe. Are your receipes for 6 or 8 quart pressure cookers? If for 8 quarts, how would the receipes be adjusted? Eager to start! 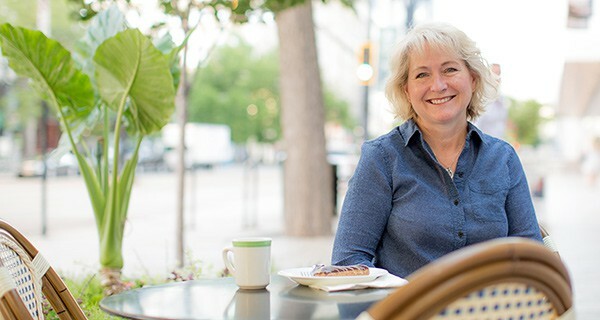 Hi Jean – the Nova Plus is a great choice. All my recipes are created using a 6 quart pressure cooker. Early in this week I attempted the short ribs – which by the way yall. IT’S AMAZING!!! Today I attempted this recipe which was also AMAZING!! 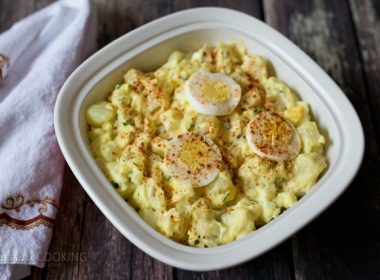 Thank you so very much for posting this recipe! It was simple and super flavorful. As someone who can’t cook.. It feels amazing thst my finished bowl looks almost as good as yours. THANK YOU THANK YOU THANK YOU!!!!! That’s awesome – thanks Lisa! I’m sure it’s just the start of many great meals. 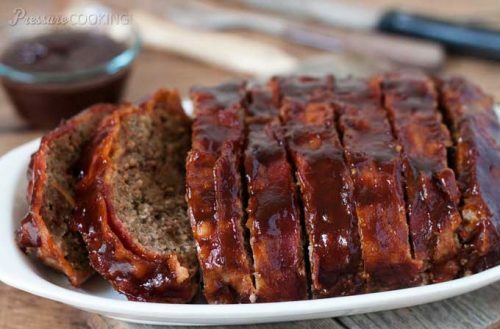 This is a delicious recipe, but with the browning of the meat in the beginning and the thickening in the end, prep and cook time was much longer than described. Hi Hank – how long to you estimate it took you? When cooking wild game like moose or venison, it’s often a challenge to find different recipes that appeal to the entire family. Made this tonight to rave reviews with moose stew meat (soaked overnight in milk): the flavors were amazing and the meat tender enough to fall apart with a fork. Only thing I added was Worcestershire sauce when simmering at the end. Thanks for a great recipe! Shared it with my entire family! That’s great – thanks for sharing your tips Steffanie! Scan you substitute the chuck roast for stew meat? I have some Costco’s stew meat. Would the cooking time change? Hi Sue – you can use stew meat instead. I wouldn’t change the time, just check the meat after the first 10 minutes pressure cook time and 5 minutes npr and see if it’s as tender as you’d like. This is exactly the warm up our house needed! I made this stew yesterday and I can most sincerely say it’s the BEST beef stew I’ve ever eaten!! 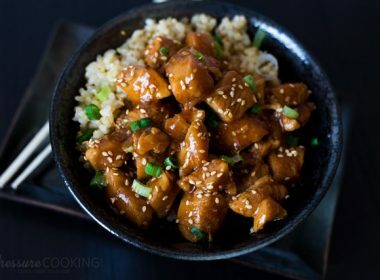 Great recipe and I used an Instant Pot. THANKS! So hearty and comforting! Can’t go wrong making this. The best recipe for a cold winter night. So heartwarming. This looks yummy, I can’t wait to try it. You can use them in the pressure cooker if you’re using the slow cooker feature, but not when you’re pressure cooking. Enjoy! It’s definitely beef stew weather here this weekend….a bowl of that would be perfect after snow clean up. I can remember cooking stew on the stove top low and slow for hours to get the meat tender…no more of that! 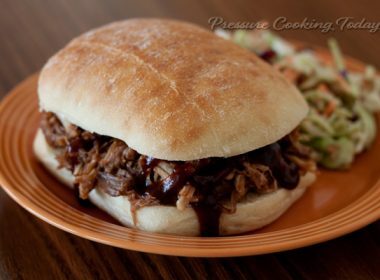 I love using the pressure cooker for dishes like this….I think it makes stews even more delicious. I always use tomatoes; however, I use whole tomatoes. I use a wooden spoon or knife to cut them into bite size pieces. It is not overpowering and adds a new layer of flavor. My Elite Platinum pressure cooker does not have the High setting. I have the Soup&Stew setting. I browned the meet (1lb). How long do I set it on with browned meat and veggies? Hi Jeanetta – I would use the soup/stew button and cook it for 16 minutes. This is a great recipe that I make often. It’s one of my go-to choices if I am making freezer meals for a friend’s who just had a baby or is sick. Today I was making a batch for a friend who just had surgery and I realized after I already started that I was out of canned diced tomatoes. I substituted one big can (28 oz) of canned crushed tomatoes and it came out even better!! I didn’t even have to thicken it with the cornstarch at the end. I may make it this way from now on! Thanks for sharing Ashley – sounds like a great addition. 1/3 cup cold water at the end but I did add celery and a McCormick’s slow cooker beef stew season package in the beginning of pressure cooking. We served over wide no egg noodles. I’m enjoying your blog. Just made this tonight. I replaced some of the liquids with red wine and added some dried herbs. Served with garlic bread. It was a big hit even with the kids. Thanks! Thanks Carmen! With winter right around the corner, we’ll all be whipping up lots of stews. Glad you family enjoyed it. I always feel so at home with warm stew and crusty bread or rolls. That stew looks like my mom’s used to with the green beans. Yum! I’ve had a pressure cooker for almost a year…. Now that cool weather is here I need to get it back out. I’m still learning.. (we cook outside in the summer) Love the beef stew recipe! Thanks Katie – I like to cook outside in the summer too. Although lots of people like to use their pressure cooker more in the summer so they don’t heat up the house with the oven. 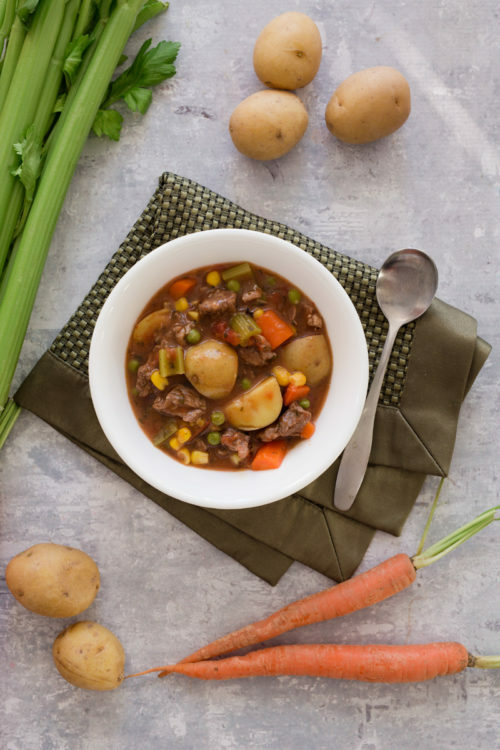 Barbara – Thanks so much for featuring my beef stew recipe! 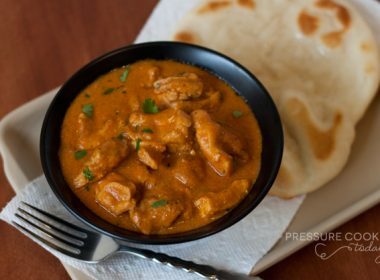 Using the pressure cooker makes it quick and easy enough for even a week night meal. I hope others will enjoy it as much as we do. Thanks Lana for sharing it – I’m looking forward to trying it.